Since we just featured a link to the Spider-Man show, it only makes sense that we cast a spotlight on that second bastion of nostalgia, the X-Men animated series! 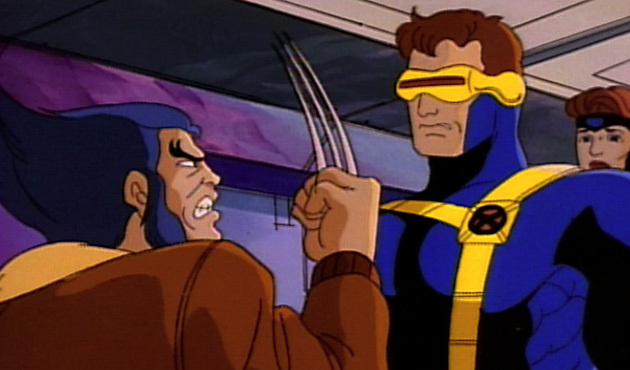 X-Men: The Animated Series started airing in 1992. This was probably my first introduction to Beast. While I was more impressed with the animation as a kid, it’s still a classic. There are 5 seasons are available at the link above. The blog is going to be light on real content for a few days while I continue quadruple-checking all the data before we upload our Marvel database, but I’ll keep featuring these Marvel shows for a little bit. This way, they’ll all be listed in Uncle Gorby’s Free Stuff Archive (now sorted alphabetically) and be part of the rotation on the sidebar. Enjoy! People tend to rag on this series a lot today, usually saying something to the effect of “the animation isn’t as good as you remember,” but I started watching it on DVD a while back, and you know what? It was just as good, if not better, than I remember. I don’t know if it was just that all the criticism had lowered my expectations, but I was very impressed with the show’s quality, both in terms of its visuals and its writing. Batman: TAS is of course the best superhero TV show to come out of the ’90s, but I think X-Men is a close second. I’m a little spoiled by Batman, honestly! I’m going to pound my cane on the floor, and declare that the only superhero cartoon animation that I’ve ever seen of which I approve is the Fleischer Superman series. Seriously. I want to see jaws that move when mouths open (or, alternately, mouths that stay g_dd_mn’d shut when the jaw doesn’t move). I don’t want femle characters who look as if their faces and bodies were blow-formed in the same mold, and then painted and accessorized to differentiate them. I don’t want to watch anything designed or drawn by someone who thought that anime and manga were remotely approximate to cool. I don’t want characters clumped together so that animators can treat them as a f_cking SPIDER — a single body with multiple limbs. I’m very much with you on a lot of those criticisms, stuff that irks me now even though it didn’t as a kid. It’s funny though, the animation that I think of that actually handles those things well is often japanese – not your standard kids anime that inspired modern superhero shows, but the weirder and more carefully drawn stuff.